Previously we discussed the initial stages of adopting a cat. This week we continue with preliminary considerations that need to be made before taking the 'plunge'. Does having a cat fit your home and lifestyle? Though cats give the impression that they are independent creatures, they are social and need attention. Cats are also predators and need to practise their hunting skills. They need play time to vent this energy and utilise their instincts. Bored and lonely cats can become stressed and revert to unwanted behaviour, such as over-grooming or house soiling. Ensure that no member of your household has cat allergies, which may interfere with their enjoyment of the cat. If you are unsure whether you or your children have allergies, visit a friend's cat or visit the cats in your local pet shop or at least Katabon Pet Market before deciding to adopt. Many animals end up in Katabon Pet Market because their owners discovered they had allergies after adopting a cat. If your children are under six years old, consider waiting until they are a bit older. Young children may not understand how to properly handle an animal and a cat may then present a danger to them. Do some research at your own level and you may consult with a local vet and pet stores to ensure that the costs associated with having a cat fit into your budget. Cats require annual check-ups, vaccines (annually), tests for diseases, etc. As they age, your cat may require dental cleaning by the veterinarian, diagnostic tests, and medications. Also be prepared for unexpected medical costs such as emergency care or treatment for a chronic health problem. Other costs for your pet include food, litter, litter trays, scratching posts, toys, and a carrier. Decide whether you need adult or a kitten? We are all attracted to kittens because they are cute and fluffy. But keep in mind that they don't stay this way for very long, and they will soon be adults. Kittens require a great deal more attention and supervision than adults. Just like toddlers, they can easily get into trouble, climbing drapes, chewing on wires, etc. You will have to kitten-proof your home even more carefully than you would for a toddler because kittens are much smaller so they can get into smaller spaces. Very young children and kittens, though a cute combination, is not a good idea. Kittens have not learned how to retract their claws and inhibit biting. Toddlers do not understand how to hold a kitten to avoid injuring it and they may also be bitten or scratched. If you choose to adopt an adult cat, their personality is already developed so you will know what you are getting and can choose one that is right for you. Adult cats are much calmer than kittens and won't get into nearly as much trouble. 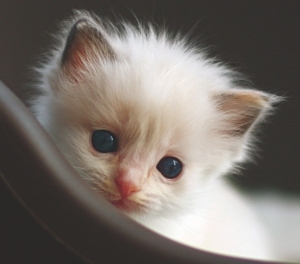 Many people prefer to have a kitten so that they can “start clean” and form a stronger bond with the animal. The truth is that an adult cat will bond with you just as strongly as a kitten, and you will be helping them since a cat's chance for adoption decreases with age. Decide whether your cat will be indoors all the time, or a mixture of indoors/outdoors. In the city, an outdoor cat runs the risk of being hit by cars, injury due to fighting with wild cats, falling from high buildings or walls and other perils. To ensure a long healthy life, plan to keep your cat indoors. Less than 10 per cent of stray cats are redeemed by their owners. A collar and id tag may be used for a cat, thus anyone who finds your cat will know how to locate you. My kitten (cross-bred local cat and Turkish Angora) is about six months old. He is a really playful and happy kitten but now, when anyone opens the main door of our house, he wants to go outside. He often meows in a loud tone. I think he is seeking a mate. If I get a female kitten, is he going to stay home? Many people say that neutering would be a better choice. But it sounds inhumane to me. I really can't decide what to do. Please help me. At six months, your kitten is now in his 'teens' and will begin to exhibit mood swings and sexual behaviour. This is the time when many male cat owners wonder if neutering will change their kitten's nature and behaviour. Neutering would indeed be a better choice. On the other hand, getting a female kitten could also be a good solution. While cats' preferences are highly individual, some breeds, such as Persians, Ragdolls and Birmans tend to be more easygoing, adaptable and gentle, and may more readily accept a feline friend. But in a cross-bred cat, behaviour is variable. So, you can select a female new-comer from these breeds. You may also adopt a local female cat from your friends and relatives or from your local pet shop. To safeguard the health of both cats, have the new female cat examined and vaccinated by a vet, particularly if she is a stray, to ensure she has no parasites, upper respiratory infections or other health issues. With the right precautions in place, all you have to do now is persuade the kitties that life is better in the company of another. I would suggest that you adopt another six-month old female cat. In an ideal new cat/old cat match-up, the newcomer would be a younger and smaller cat that is of the opposite gender. The resident cat's disposition should be compatible with the newcomer's and they should share similar energy levels. An older cat that's been the only pet for his entire life will adapt more slowly to another cat's presence and may especially resent a bouncy kitten. On the other hand, a kitten just separated from her littermates may be grateful for companionship. If one cat is or was a rescued kitten, his life has already been filled with stress, and he may be fearful about living with another cat. Bringing a new cat into your home, even with careful preparation, can still be a stressful experience for your cat. Their first and subsequent early encounters may be marked by hissing or growling, which are feline indicators of unhappiness. Never simply place a new cat in your home and hope the cats will work things out for themselves. More likely, without patient human intervention, the two will fight or the resident cat will express displeasure by marking your floors or walls. Secure the two cats in separate rooms; mingle both cats' scents on a sock or washcloth (by rubbing the cloth on their fur) and place the objects next to their feeding areas. Supervise their initial encounters to help the relationship progress smoothly. Cats do not like change, and will notice even the addition of a new piece of furniture in their territories. So, a cat's first reaction to a new feline arrival may be anxiety or confusion. Set up one litter box per cat, with one extra, in separate areas, and check to see that your male cat is not displaying his unhappiness by 'doing his business' outside his box. The presence of another cat, even if unseen, presents an inconvenience to your existing cat, so to minimise this change in his household routine, offer him quality time and opportunities to play or simply sit on your lap if he wants to. With both cats sniffing the other's scent on those cloth items you've offered, they'll be familiar with each other even before they meet face-to-face. Let the resident male cat see the new one through the partially opened door of his safe room, and once you've repeated this for a few days or a week, allow them to meet, with your supervision, in a neutral room. They'll sniff at each other, and may posture with tails up or just stare. Offer a toy they can share to encourage them to play. If one or both cats seem stressed, keep the encounter short, and then repeat for a longer period later. Gradually, they will accept each other. If either cat flattens his/her ears, growls or spits, you can clap or talk loudly to distract them from getting into a fight, but if their aggression ramps up, separate the cats for a day. Try another meeting after they have calmed down. Their period of introduction and adjustment may take weeks or even months. Cats with aggressive temperaments will instinctively stalk or attack shyer cats that may retreat or hide. You'll need to offer a lot of reassurance and extra attention to each cat if aggression becomes a factor. Since the resident cat and the new one is of opposite gender there is good reason to hope for a happy feline home. And when both cats do accept the reality of a multi-cat home, they can tolerate each other without fussing, or become devoted friends, sometimes grooming each other and sharing space on your couch. They may realise that your attention and affection is doubled, just for them. Returning to the point of neutering, in most of the cases, not neutering your maturing kitten will most likely result in feline behaviour that you won't like. This behaviour can range from a tendency to roam, fight and spray urine to attract females. Neuter surgery, on the other hand, will not only curb the negative behaviour, it will transform your maturing kitten's personality and behaviour in profoundly positive ways. One of the foundations of a good relationship, any kind of relationship, is sharing. You share stories, gossips, secrets, and jokes. When times are hard, you share the burden of your sorrows and they feel lighter. At work you share ideas and collaborate to create something new. This is particularly true. Over the past decade or so, the austere restrictions on men's fashion have eased up so that you see men exploring areas traditionally considered the purview of femme fashion. Manly men can now wear pink without batting an eyelid. The average guy on the street has more choices when picking a colour for his new shirt. Paisley is back and rocking pretty hard. The hipster revolution has even brought in the dubious fashion of skinny jeans for men (we're still on the fence about that one). For women, though, it's so much easier to borrow something from the men folk and make it work. Let's look at a couple of male accessories that look oh so chic on the ladies. What are regular-fit, straight cut jeans on him are delightful and grungy baggies on her. Made popular by Katie Holmes back when she still had Tom Cruise jumping on the couch, this style is casual, comfy and relaxed. Whether you're stealing a pair from your brother, dad or significant other, or just buying 'em off the rack in the menswear section, make sure they're close to your natural size, and not too baggy. And since these are on the loose side, they're best paired with a fitted top. Belt them in, add some girly accessories to feminise the look, and you're ready to roll. Uma Thurman created a powerful visual impact in Pulp Fiction in her simple, edgy white shirt and cropped black trousers, doing the twist with John Travolta in a 50s themed bar. Sharon Stone set the fashion world on its head when she paired a Vera Wang skirt with her husband's white Gap shirt and wore it as a two-piece evening gown. A wardrobe staple for men, it is a wonderfully stylish garment that can look smashing on a woman if worn right. Roll up those sleeves, pair with your favourite skinnies and it's casually elegant. Leave the shirt unbuttoned, over a long, colourful tank top and printed trousers or leggings, and cinch the waist with a belt, and that's a look perfect for shopping, followed by a ladies' lunch. The possibilities are endless. Slim bands and delicate dials work very well for evening wear and add a touch of glam to your favourite formal sari. But a chunky man's watch makes a bold accessory for your casual clothes. Choose a metal strap and a round dial for greater versatility. It even works with shalwar kameezes. These are just a few things you can steal from your father/brother/significant other and make it all your own. There are plenty of other pieces that can be made over, with a little imagination, into something chic and unique. Layers of wool will obviously keep us warm long enough until the dreaded time comes when we have to shed these and hop under the shower or into the tub unless we want to look like the haggard homeless coupled with unpleasant odours that will send anyone in a radius of five feet running off. Since showers are inevitable and the chill is merciless a burning hot bath feels great. However, what the intense heat of a hot shower does is it makes the skin more vulnerable by breaking down its lipid barriers and letting moisture loose. Unless you are a big fan of dry, cracked skin, stick to warm water, not scalding hot water, for your bath and cut your long shower by half. If your skin has become so dry that it itches a lot try taking showers with lukewarm water and baking soda; this will relieve you of the itchiness. Also, keep applying heavy moisturiser periodically.